The Houghton County Democratic Party added this caption to the above photo on their website, "Our Keynote Speaker was historian and author, Gary Kaunonen, who spoke about events during the 1913 mining strike in Houghton County." The May presentations have come and gone with two presentations given to two outstanding audiences. The first presentation given in mid-May was to the Houghton County Democrats as part of their program, "1913-2013: A Century of Solidarity." I was one of four speakers at the event, and though I gave the keynote, any one of the four speakers could have fit this billing. 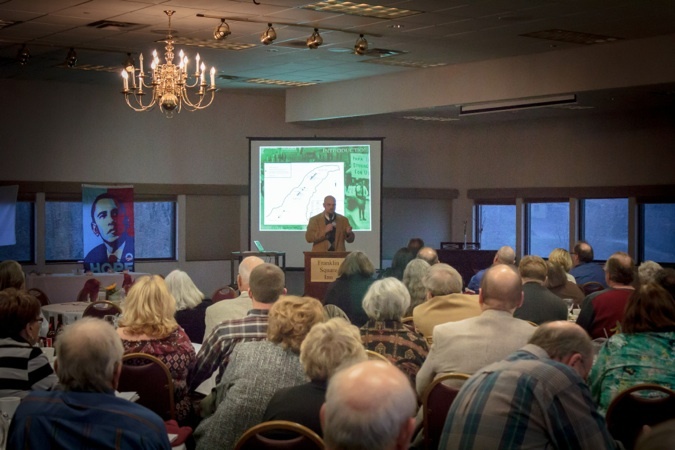 The presentations were an excellent accounting of organized labor's past, present, and future in Houghton County. Among the other speakers were former Michigan Senator and Steel Workers member Mike Prussi, current Michigan House of Representatives member and union member Scott Dianda, and Michigan Education Association member Terry Lajuenesse. My keynote included updates on research from Community in Conflict, the 1913-14 Strike's national significance, and why a strike that happened 100 years ago has relevance today. The 1913-14 strike's relevance to today's labor situation is very noticeable in Michigan, where we are seeing our rights to free speech, freedom of assembly, and the right to collectively bargain being whittled away, and sometimes shamelessly stolen in the middle of the night by autocrat governor Rick Snyder and his anti-labor goons. 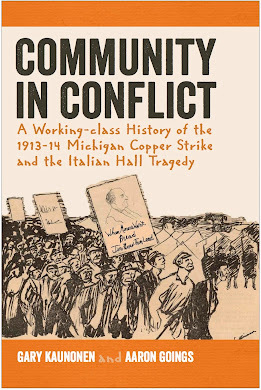 Today, organized labor is in the fight of its life, and lessons of solidarity and commitment to a cause can easily be appreciated and understood by examining the efforts of working-class families during the 1913-14 Strike. I was graciously given a standing ovation for my remarks by the 60 or so people in attendance, but getting to talk with folks after the program was the real "payoff." Copper Country residents are so proud of their history, regardless of political affiliation, and talking with folks at this event really highlighted the importance of remembering the past to inform our future. Giving a presentation as part of Keweenaw National Historical Park's Fourth Thursday in History series. The presentation location, in Calumet's Visitor Center, was a unique experience in a historic venue. There were 75 plus people in attendance for this presentation, which was a part of Keweenaw National Historical Park's 4th Thursday in History program. 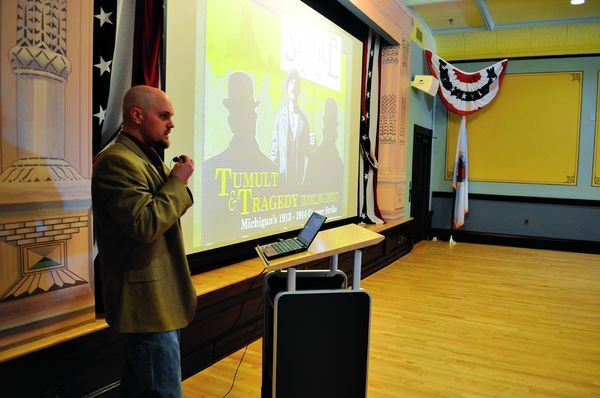 I spoke on the work I did as Project Historian for the "Tumult and Tragedy" traveling exhibit's project team, which was rounded out by Project Manager Erik Nordberg and Project Graphic Designer Mike Stockwell. After the presentation I joined people in the Visitor Center's traveling exhibit space to answer questions on the exhibit. The local newspaper, the Daily Mining Gazette, covered the event, and the story on the presentation can be read by clicking on this link: http://www.mininggazette.com/page/content.detail/id/529934/Telling-stories-of-the-strike.html?nav=5006.